Riot police are police who are organized, deployed, trained or equipped to confront crowds, protests or riots. Riot police may be regular police who act in the role of riot police in particular situations or they may be separate units organized within or in parallel to regular police forces. Riot police are used in a variety of different situations and for a variety of different purposes. They may be employed to control riots as their name suggests, to disperse or control crowds, to maintain public order or discourage criminality, or to protect people or property. In some cases, riot police may function as a tool of political repression by violently breaking up protests and suppressing dissent or civil disobedience. In recent decades, observers have noted the increasing militarization of riot and protest policing, with police deploying snipers, flashbang grenades and guns with plastic bullets. Riot police often use special equipment termed riot gear to help protect themselves and attack others. 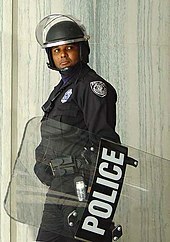 Riot gear typically includes personal armor, batons, and riot helmets. Many riot police teams also deploy specialized less-than-lethal weapons, such as pepper spray, tear gas, rifles that fire rubber bullets, stun grenades, and Long Range Acoustic Devices. ^ Rauch, J.; Storey, D. (1998). "The Policing of Public Gatherings and Demonstrations in South Africa 1960-1994". The Commission on Truth and Reconciliation (TRC).